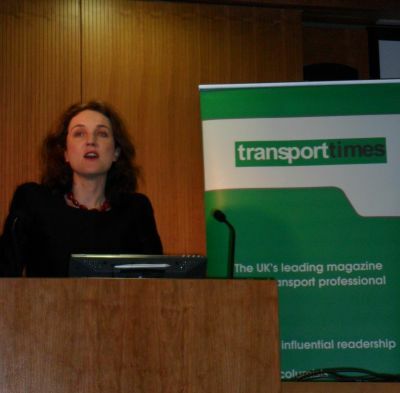 Last Wednesday Junior Transport Minister Theresa Villiers led off a thoroughly interesting Transport Times air transport conference at Central London’s impressive King’s Fund conference centre. The keynote speaker, Villiers, admitted that the Government had no policy for aviation in the South East. She seemed in a more conciliatory mood towards the problems of the London area than has been the case in the past. In March the Government will issue a “scoping document” as part of an air transport review in 2012. The usual anti third Heathrow runway rhetoric was not apparent and asked by AERBT whether one answer to the Heathrow movements problem was to increase the opening hours she evaded the question in typical political fashion. She said that the government will act to cut border queues at airports, improve resilience to bad weather and make security “more passenger friendly”. She did not explain how. The same session included Daniel Moylan, Deputy Chair, Transport for London, reporting to Boris Johnson, Mayor of London, .and Baroness Jo Valentine, Chief Executive, London First. Mr Moylan opened up by saying he was a banker with no knowledge of air transport, something that clearly became apparent when he virtually argued with himself stating that new airports were what was wanted and then praising Amsterdam and Charles de Gaulle. Whilst he proved to be a charismatic and interesting speaker what he had to say hardly stood up to scrutiny but he did point out correctly that urgent decisions are needed regarding airport policy. He spoke of airports being “full” not realising that “full” is normally associated with runway capacity, but in fact with large aircraft replacing earlier generation jets and turboprops there is scope for increasing passenger numbers. One got the impression he was willing to learn and hear the other side of the argument. Jo Valentine eloquently put the case for London, a sort of city state, but now no longer with its own minister, the position scrapped by the new coalition administration. London however does have Boris. The Minister of State had earlier evaded questions regarding APD saying that it would be reviewed in the next Budget, due in March. This was a subject raised during a further session in which Steve Ridgeway, Virgin Atlantic’s expansive Chief Executive, put the case for the current system of passenger taxation (everyone agrees now that is what it is). He showed some interesting graphics and predicted that Virgin will have flown 85% full over the last year when the figures are announced. He said that any change of taxation would affect the vital (non-taxed) transfer traffic. Likewise the crucial cargo element in long haul, showing a slide comparing the amount carried by Virgin compared with easyJet, in favour of whole ‘plane tax, the amount insignificant. The European emissions trading scheme (ETS) is coming in which will further confuse matters. ABTA chief Mark Tanzer more or less reiterated Mr Ridgeway’s views pointing out that research indicated one million less visitors per annum to the UK by 2015 if the tax continued to rise. The case for whole ‘plane tax was put by easyJet’s Chris Gadsden, in the absence of Carolyn Mccall, Chief Executive, the published speaker. He put forward the obvious argument that short haul operations produced less emissions and pointed out that the Prime Minister had favoured per ‘plane duty (PPD) and said so in a recent visit to the airline. The final session was given over to BAA chief Colin Matthews explaining what went wrong at Christmas with the snow at Heathrow. John Jarvis, Transport Director of Northern Way, a lobby group, and Sir David Rowlands, formerly a high flyer in the Department of Transport responsible for the High Speed 2 deliberation and now, as Chairman of Gatwick Airport Ltd, were seemingly opposed to it saying emphatically that any railway project would not replace flights from London to the north. Let’s just say that Mr Jarvis, of all the speakers, was downbeat, casting a gloom on northern airport development prospects although highlighting the success of Emirates at Newcastle. Mr Matthews again admitted mistakes had been made over the snow period but also said that the media had been guilty of misleading the public. “The airport was not closed for five days,” he repeated but also was at pains to find out why a report stating “the airport may open at four” somehow became “the airport will open at four”. Foreign airlines were accused of boarding passengers for publicity purposes, but this could be put down to a misinterpretation of announcements. Hopefully the enquiry will come to some conclusion that can be turned into future crisis procedures. Sir David was full of praise for Heathrow which he said should be developed. He described the government’s aviation policy as “ludicrous”. Gatwick was concentrating on its current vital development and was not thinking at this time of a second runway post 2019, which of course is currently stifled. His bright and breezy presentation rounded off an interesting day only marred by a lack of interest and attendance by Britain’s regional airports, and no presentation by British Airways. In summary the Government clearly does not know what to do regarding the South East airports problem. The possibility of new runways at Heathrow, Gatwick and Stansted is not completely dead. We learnt in an aside that in the case of BAA, the land acquired for the possible expansion has not been released. Sir David put it well in concluding his speech. “It should be the market, not any regulator, that drives service standards and decides the future success of Britain’s airports.” And turning to the government. “It most certainly does not mean announcing policy piecemeal, without evidence and in ways that then constrain strategic choices. For that is dangerous. And that I fear is exactly what the Coalition Government has done with runway capacity in the South East".